What is the difference between a "Milk or Milking Goat" and or a "Dairy Goat"? Really, nothing....however, usually a milk or milking goat or goats are owned by someone milking them for their own use, these folks only have a few goats and are milking by hand. A "Dairy Goat or Dairy Goats or a Dairy Goat Farm" have the same type of goats, many times from the same lines as the "Milk Goat" only the Dairy Goats live on a commercial farm where the milk is sold in bulk. These Dairy goats are milked by machine and there are normally many goats on a Dairy Goat Farm. Dairy Farmers are more particular about the conformation, utter placement, milk produced and sometimes even breed of the goat then someone would be that is using the goat's milk for their own drinking, cooking, making homemade cheese and or soaps for their own families would be. Please note that we do have a Working Goats website (see Sister Sites) for goats that are packgoats or goats that carry packs, pulling, draft, driving or wagon/cart goats, agility goats, obstacle course goats, goat tricks and more. Please visit that site for more information about goats too. I had had goats, I had trained goats to pack and to pull. I was ready for a Milk Goat....or so I thought......how hard could it be? After all, I had gathered chicken eggs for years. The first time I tried to milk my "milk goat" Pinecone, it did not go well. I was given a ewe lamb and needed the milk, so I bought this goat I liked that gave quite a bit of milk. Pinecone turned out to be that "one goat". That one that followed me everywhere, helped train and taught all the other goats after her, she waited for me to come out of the house just to spend time with me. Pinecone sat at my feet anytime I was outdoors in a lawnchair, she was a true friend. A very wonderful and smart pet. This is her with three kids in the photo, she is sorely missed. But she and I did not start out that way. Oh No! It started out with her trying to put me in my place as I tried to put her in her place. A war of the wills. There were even a few tears involved. So remember I needed the milk to feed my new little ewe lamb. <READ, NEEDED THE MILK> Not knowing much except what I had read about milk goats in books, and since I did not need that much milk I headed out to the pen with a plastic cup. I have the lamb's bottle all ready to go on the counter and I was just thrilled to be not only bottle feeding the lamb, but to milk my own goat. I got out there and Pinecone looked at me like "You have got to be kidding me, right??!!" As I leaned over her and grabbed and pulled (gently of course) on her udder...well? If you know anything about goats, you can guess how this went. By the time I had the cup kicked out of my hand and she had moved away from me for the third time, I started to panic, I NEEDED THIS MILK and the lamb was starting to let me know she was hungry. So I went and got Deron. He held her, I squeezed her and I did get enough milk for the bottle....and that, the lamb using the bottle, is quite another story. Let's just say it all did get straightened out and all was well, and I even learned to milk the goats. Deron built our Milk Stantion early on and what a difference that made for all the problems I was having. He built it all with "scrap lumber" we had sitting around. 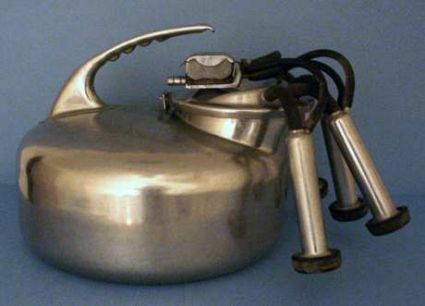 I have used it for years and it is still in wonderful condition. And bless his heart, a lot of milking years and stories have gone by way too quickly. Deron has taken pity on my hands and is gathering and setting up a nice Surge Goat Milking Machine. I tell you all of that to tell you that milking is an art. Goats are goats. So it does not always go well and seldom goes well for the first time milkers, people and or goats. But goats and milking goats are/is a wonderful experience and I do recommend it for all the people who's live styles will allow it. So? I will warn you. When you first start milking goats, you may find that you understand the old sayings "She kicked the bucket" and or "Don't Cry Over Spilled Milk". There are some things you will need for milking your goat(s). Can you just go out and bend over your goat, or sit on the ground and milk her into a small pail or even a cup? You bet, but that gets old and hard on your body. Speaking of old, the older you get the harder it is to milk from these positions, especially if you are milking more then one doe. A milk goat stantion is the way to go! You must have a "freshened doe" to get milk from her. What is a "freshened doe"? One that has just had a kid/baby goat, or was milking from being freshened before you acquired her. So, you must have a buck or be able to use a buck for breeding. Buck + Doe = Kids & Milk. A doe that is not bred and does not produce a baby will not milk no matter how nice you talk to her. When you get or buy your buck/boy goat, make sure it has testicles and it is not a weather (castrated). There is a big difference. Along with a freshened doe, or having a buck on your place you will need a Goat Stantion or what is also called a Milk Stand (goat sized of course). If you are just using the milk for your own use a wooden one is cheaper, easy to build and can be made to your own standards. 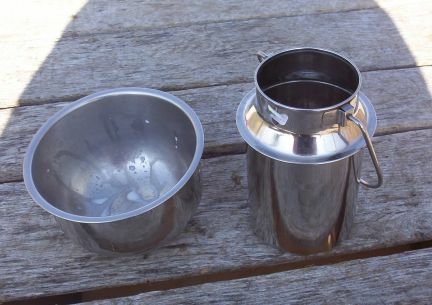 But if you are planning to sell the milk, you must have a metal stand. A stool for the station is a must. It can be made as part of your station or separate. Mine is separate and we use it for many other things, like working on rabbit cages <she grins>. You will also need some goat pellets and or corn to feed your goats as you milk them...not a lot of grain but a reward all the same. You will need a clean "bucket" to milk into. Of course stainless steel is best, but really when you are first starting a one gallon plastic ice cream container can be used. That will also give you a great excuse to buy and hurry eat that ice cream out of the container too. I would not use anything less then a one gallon bucket. When you take your milk into the house you will want to filter or heat up your milk. I store my milk in glass containers that came with glass lids with a rubber seal for my milk. I bought them at Walmart for under $5. You will want to move your milk right away and get it into refrigeration or at least (as we will now be doing) into an ice chest quickly. You must have patience and a good since of humor and perhaps even a heavy dose of "I love goats and or goat's milk". You also need to be a person that "sticks to things". Milking goats is work. It is fun work, we look forward to it, most days, but it is work. Not only do you have to go out each and everyday, at least once, usually twice per day, but the goats will have an off day now and again too, they might just act silly, or really be cantankerous. Most goats will just jump right up on the stantion (after being trained) and be milked....some, however, find it fun and funny to aggravate the milker. Remember when you were small and your mother and grandmother used to harp on you "If at first you do not succeed, try, try again"? With goat milking this holds true. Few people milk and milk a goat well the first few times they try it. The photo is of our little buck, Esau. We are showing here <grin and a wink> one of the most important parts of producing milk. The testicles. Without them, no breeding, without breeding, no kids, without kids, no milk. If you are kind, gentle and fair to your goats they will line up to be milked...having a bit of grain for them makes it very appealing for them too. This little buckling has HIGH HOPES!! LOL You can see from this photo that the goat milk stantion or milk stand, is a very popular place. We feed our milking goats grain only while they are in the station. For most of my does I do not need to shut the neck braces, they are also glad to be milked for the relief it gives them. As you can see from this photo that DragonFly is very impatient for her turn to be milked, see the doe in the stand is eating grain <?> That is why they all line up to be milked and can barely wait their turns. Always milk your head in the pecking order the goats have worked out between themselves. You can also see from this photo that milking is done everyday, that is every cold day, every rainy day, every cold and every snowy day, every day whether it is your birthday or Christmas or whatever. Everyday! Goats are usually milked twice a day. There is so much you can do with Goats Milk. Drinking it, cooking with it, anything you can do with cows milk. You can also make soap, lotions, cheese, you can feed it to any baby animal, domestic and wild, as is, straight from the goat or warmed from the fridge. Goats milk is great stuff. And the best part of goats milk is owning the goats! Deron and I live way out off grid. So we talk to many folks that are or would like to live as we do. One thing we hear often (from "city folks") (make no mistake, Deron and I were "City Folks" too at one time) is that they "want to have horses, goats, rabbits...... to live off the land". Well, that is great, until they hear the responsibility it brings. Usually what we hear is that they want a cow....never being around a cow in their lives of course. We always recommend a goat. Smaller, easier to work with, eat less, take up less room, and they give enough milk for even a large family (and some days, when the family is not using much milk, their friends can have some of that milk too). 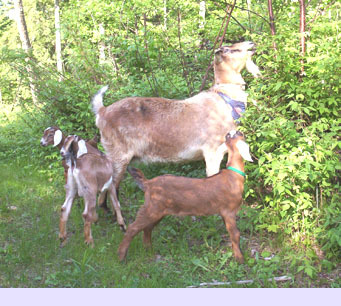 We recommend for first time goat milkers to start small. Milk one good Dairy Breed goat and see how it goes. So many people see that gallon of milk once or twice a day and start thinking dollar signs....believe me, it is not simple to make money with goats milk. If you do not need the milk of two goats, do not milk two goats the first or even the second year(s) when you first start milking. Either let the goat kids stay with their mamas or better yet, milk the mamas and bottle feed the kids....it makes the kids friendlier and more manageable as kids and as adults. Your future does will be easier milkers if they were bottle fed as kids. Milking goats is not something you do when you want a glass of milk. It is not like walking over to the refrigerator and getting the amount of milk you want and walking away, forgetting about it until you need or want a bit more. Milk Goats need, that is need, to be milked everyday at least once. Most people milk twice a day everyday. Everyday means everyday. Yes, even Birthdays and Christmas and when you have plans and the day you want to go do something else. Everyday means that you still milk the goats when you are sick or injured or if you are having a bad or sad day. It means that even if it is really really cold, snowing, raining, tornado warnings, or hot as the devil, you still go out and milk the goats. If you are going out of town or will be gone for a day, you will need to have someone come in and milk your goats for you. Goats need to be milked everyday. So be sure this is something you really want to do. It is unfair to the goat, it is unkind to the goat, not to milk her on time and daily; that means <grin> everyday. I have started bringing my newborn kids in, mostly because of the extreme weather here, and bottle feeding them. However, once a day, when I go to milk, I take the baby/babies with me and put them on their mamas while mama is in the stanchion. I also feed the milk from more then one mama to the babies. My goats come over when I take the babies outdoors to potty and walk them around. They sniff them and love on them. I have found that not only does this increase the bonding between myself and the goats, but also the babies fit right into the herd as they grow. This way you get the best of both sides, the bonding with not only goats, but also humans. This will make working and or milking the babies, when grown, much easier. Here is one of those questions that has sooooo many answers. It depends on how much milk you want, how much cream you want in your milk, how much room you have for the goats, what breeds are available in your area, and of course, what goat breeds you like to look at most. Many people, and I am one, have not only different breeds in my small herd, but also mixed breeds. I like the Nubian look, I also love my Saanan. Many of the mixed bred goats give as much milk as a well bred Dairy Goat. If you are looking to get as much milk as possible and money and travel are not a factor in your quest, by all means, research the Dairy Breeds and go from there. Buy the very best you can afford. Check out the Extensions (4H) Office, the Agricultural Offices, and the Fair Boards in your area. Ask at your local Feed Mills, read the adds in the Farm Stores on the bulletin boards. And of course do an Internet search. However,if you do not need much daily milk you will not need a top of the line Dairy Bred perfect conformation goat. But I do recommend you looking for one as close to these standards as you can come if you want a good milking goat. Any goat can and will give milk, some more then others, that is even within a breed, some goats with better breeding lines, better conformation, are better milkers. But, as I said, any goat can give milk. Meat Breeds and Angoras as well as the smaller breeds are not going to give as much milk as a Dairy Breed goat. See below, we do milk our Pygmy Goat. I always say you can tell the person that knows nothing about goats when they open their mouths and say things like "Goats will eat anything. ", "Goats stink. ", "Goats will eat tin cans. ", "Goats are stupid.". All of these statements are fictional....do buck goats stink in rutt, you bet! Does, kids and weathers have less order then the family dog! For good milk you need to feed your goats well. Yes, onions, sage and many other plants matter, and neither of these two you want in your milk. Not only do they need to eat right, they need to eat a lot to produce the amount of milk that the owner will want to see coming out of those big healthy utters. Milk goats need grain and vitamins and minerals and salt daily. In the winter, if not more seasons, your goat will need a good grade Timothy Hay. Goats are picky hay eaters, they will pick out the good stuff and step on and potty on, the rest. It is best to have a hay feeder to keep the hay up, not getting stepped and pottied on, so that when they finish the good parts, they will/might eat the rest too. Goats are "browsers". That means they eat high and low, the good stuff. I have actually had several people say that they are going to get goats to put in with their horses so that they goats will eat the weeds and scrubs that the horses do not like.....guess what? Goats might eat those items the horse owners would like for them too, but more likely, the goats will eat what the horses are eating first...the good stuff. Keep your goat's hooves trimmed. Keeping your goat's hooves trimmed will do much for your milk. First of all, it will keep your goat pain free. It will keep the goat stand cleaner, and your goat will be able to get on and off the stand easier. 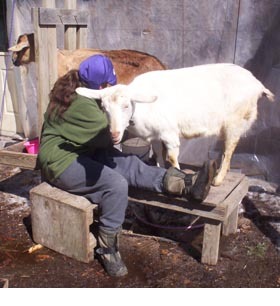 Keeping the hooves trimmed will help keep your goat on it's feet, keeping dirt off your goat's utters. Keeping your goats and the milking equipment clean is very important. Keeping your goat clean and cleaning your goat milk bucket may be a "no brainer", but it might surprise you that every piece of equipment needs to be very clean and sanitized each time you milk your goats, not just everyday. Every piece of equipment means not only the bucket and or glass or stainless steel milk container, but also your goat stantion/stand, your hands and or each piece of your milking machine. Also your milk straining equipment and or any other items that will come into contact with your fresh goat's milk. Giving your goat a good grooming/brushing everyday and or at least weekly will help keep goat hair out of your milk bucket. You will need to wash the goat's utters and your hands (after you clean the goat) each time you milk, morning and afternoon. The cleaner your milking habits the safer and better tasting your fresh goat's milk will be. Milking our Pygmy Goat? 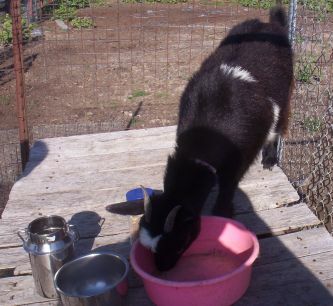 Yes, we milk our Pygmy Goat....why not? You of course will not get as much milk as you will from a Dairy Bred Goat, but you might get enough to make it worth your while. Atia (pronounced at-TEA-a) is a cute little Pygmy Goat I bought pregnant. I had wanted a Pygmy goat for some time. Not to milk of course, just wanted a little goat to train and play with, put in parades and such. So after much research, we bought Atia. Atia blessed us, two days after moving here, with Octavian (pronounced Oc-TAY-vee-an), a tiny, little, itsy bitsy buckling, who looks almost identical to his little bitty mama. So, why not milk her. Some people have several Pygmies that they milk daily. Remember now, Atia is only 19 1/2" tall. So now you have an idea of how small these teats are. Of course you will need smaller milking equipment for the smaller breeds of goats. 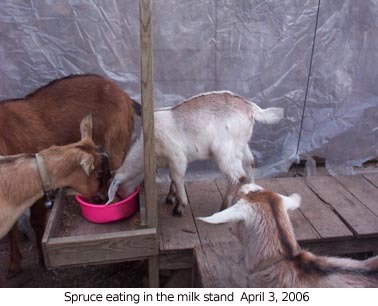 Yes, some people even use goat milking machines that they have adapted for the smaller <read tiny> teats. If you are however only milking one or two of these tiny goats it would just be easier and faster to milk them by hand. Our stainless steel milk can is 6 1/2" tall and I found it at a Garage Sale for .50! I though it and the little stainless bowl (found the same day at the same sale) were quite the find, I paid $1 for both. Deron has been "building" our milking machine piece by piece. Surge Milking Machines are very expensive and have been around for many years, tried and true. Deron has been able to get a part here and a part there pretty cheaply. We were able to, believe it or not, get the Serger Vacuum Pump with a motor for $25!! He saw it on an online auction site and we happen to live about 100 miles from the farm that was selling it. So we saved A LOT on shipping. Deron has "fashioned" a few pieces that were missing on the machine. Piece by piece and little by little it is coming together. Actually the machine IS ready, but we need a better motor. Right now the back of our horse trailer is our "milking parlor". Here is a photo of Deron doing a test on the motor and pulsation...notice all the help he has. Since this photo he has built a fence around the motor area, you know? To keep the "help" out. When you bring that fresh goats milk in fresh on a cold morning, heat some up to a boil, let stand for a few minutes. Pour in a cup with your favorite cocoa....yuuuuuum! I used to add cream to most hot chocolate mixes, not anymore! When you finish your morning feeding and are ready for a really great breakfast treat that could not be better for you, put some fresh goats milk in a pan and heat it up. Add you favorite brand of oatmeal, fix as the directions say to on the oatmeal box, only add no water, only the goats milk.......yummmmmmmm! We call it "Goat Meal". Be Warned! It is really, really rich, you will only want a very small portion per person. Make in an Ice Cream Machine. Heat one gallon of goat's milk to 180 degrees, add 1/4 of vinegar to the milk in the same pan after you take the milk off the stove. Stir, let it sit, then poor through a cheese cloth. Really good with spaghetti. In a medium bowl, whisk together the dry ingredients. Over medium heat, combine milk, butter and vanilla until the butter has melted. Add dry ingredients to the milk mixture, constantly whisking. Boil, stirring constantly until thick and smooth, about 5 minutes. Cool and refrigerate unused portion. The contents of this page for Milk Goats & Goat Milking is still under construction. Please check back later. Milking a goat is not rocket science, people have been milking goats for as long as there has been people...read Genesis in the Holy Bible. However, I would highly recommend that you do more research, read books, magazines and websites on Milking Goats before you decide to jump in and buy goats for milking. Be fair and kind to the animals, please do your research before buying your animals.